Hayden Point House is truly a home away from home with clean, classic lines and a nod to modern design. Located on Hayden Point in South Thomaston, the house overlooks the Weskeag River, a salt waterway that broadens into several large coves before emptying into the Mussel Ridge Channel. This house is immaculate and truly comfortable. With unobstructed views of the water from virtually every room and plenty of outdoor space to enjoy, Hayden Point is a relaxing retreat. The first floor is the main living space with an open dining room, which seats 6 comfortably, and living room overlooking the front lawn and the water beyond. The kitchen is fully-equipped with solid-surface countertops, cherry cabinetry, an electric oven, gas cook-top, microwave, double-door refrigerator and dishwasher. The kitchen has a breakfast nook, an island for eating in-kitchen and double French doors leading to the wraparound deck. The deck has plenty of seating and a gas grill. The living room and den area is outfitted with comfortable furnishings, a flat-screen television, cable, a DVD player, stereo and Internet access. Large windows overlook the deck and the expansive lawn and waterfront. A slate-tiled foyer leads to a powder room and the first of the two bedrooms on the main floor. This first bedroom has a queen bed and is located at the back of the house. The master suite is off the main living area with a king-sized bed. This room overlooks the water and with windows open, enjoys a breeze off the river. The master bath is en suite with a garden tub and a custom tiled shower; off the master bath is a separate vanity area with a sink and a lighted mirror. The third bedroom occupies the entire upstairs of the house. This room has a 180-degree view of the water, two twin beds that can be made into a king and a queen sleeper-sofa. A full bath with tub and shower is located on this floor as well. A game table, games, local guide books and maps are also included. Hayden Point owns 100 feet of saltwater frontage making access to the river for fishing, swimming, kayaking or canoeing easy from the front yard and steps leading down to the water. At the waterfront is a ramp and floating dock. There is also a boat launch open for public use about 1 mile from the Hayden Point House. 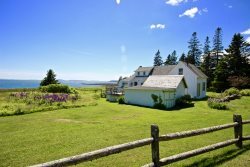 There is also a general store where you can purchase lobster, a post office, public library and several shops within walking distance from the house. All linens are provided and are 100% cotton. Pets are allowed with owner permission. There is a washer and dryer for guests to use as well. South Thomaston is located just five miles from downtown Rockland, 15 miles from Camden/Rockport and five miles from the St. George Peninsula and the villages of Tenants Harbor and Port Clyde. PLEASE INQUIRE. **This is an OWNER MANAGED PROPERTY. THE OWNER WILL COLLECT DEPOSIT, PROVIDE THE LEASE & COLLECT THE BALANCE, SECURITY DEPOSIT AND PROVIDE ALL PROPERTY INFORMATION. SEE NOTES TAB FOR OTHER INFORMATION. All linens are included for the maximum number of people allowed. Paper goods: a starter supply of paper goods (paper towels and toilet tissue) will be available upon your arrival. Typical amounts are 1 roll of paper towels and 1 roll of toilet tissue per bathroom. Check in and out times: Check in is 4:00 PM and Check out is 10:00 AM. Early check in/out are not allowed in the high season. Guests who have not vacated by 10:00 AM will be charged $25.00 every 15 minutes after 10:00 AM. Televisions and type of service: 1 flat screen TV with cable. Water access, beach access: Waterfront is accessed by a private dock which cannot be used to store boats larger than kayaks. 3 sandy beaches are 5 minutes away. Watercraft: no boats are provided with this rental per insurance regulations. However our concierge service, Bayview Concierge, is available to rent and deliver kayaks, canoes, etc. to you. Items you should bring with you: laundry detergent, beach towels, beach equipment (tents, umbrellas, folding chairs, toys, floats, etc. ), bug spray, sun screen, baby equipment (you can always rent equipment from our partner Midcoast Family Rentals), shampoo and other toiletries, dog leash.
.**This is an OWNER MANAGED PROPERTY. THE OWNER WILL COLLECT DEPOSIT, PROVIDE THE LEASE & COLLECT THE BALANCE, SECURITY DEPOSIT AND PROVIDE ALL PROPERTY INFORMATION. A REFUNDABLE SECURITY DEPOSIT OF $500 WILL BE DUE IN ADDITION TO THE RENTAL AMOUNT. ***RATES ARE FOR 4 GUESTS. AN ADDITIONAL $25/NIGHT PER ADDITIONAL GUEST APPLIES. REFUNDABLE SECURITY DEPOSIT $500, $600 WITH PETS.